Fall is here…you feel the nip in the air and the leaves have started to fall and form the red and gold carpet . undisturbed by a single moan of protest….. 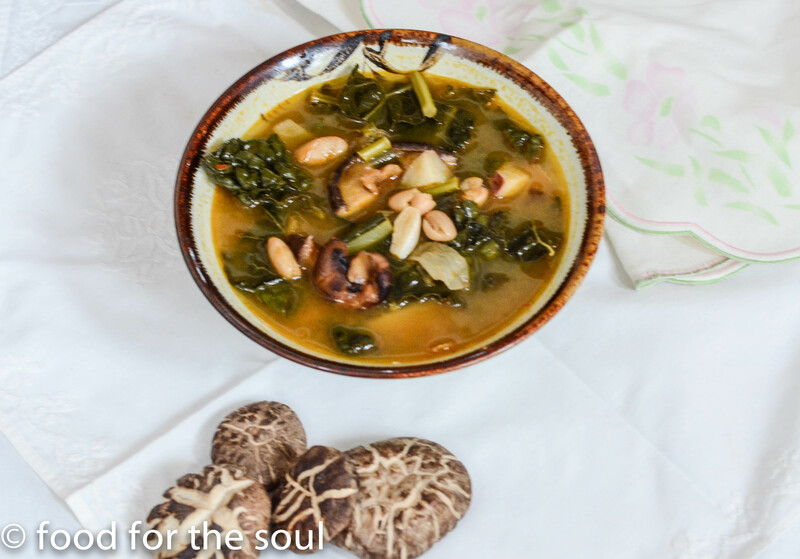 The most beautiful time of the year and perfect for this soup. More fall recipes…more warmth of this beautiful season. Time for thanks and blessings. This is a soup that will make you close your eyes with every spoonful to savor the flavors. It is spiced up with a green chili, ginger, turmeric and cumin. It is also vegan if you omit the goat cheese on top. Butternut squash is roasted with a drizzle of olive oil and spices, the walnuts are toasted and the Sage from the garden is perfect with this soup. If you can’t find the fresh ginger and turmeric root please use the dry powder. Cut the squash in half, remove the seeds and smother with salt, pepper, cumin powder and olive oil. Roast in 375 degree for 45 minutes. When done, remove the skin and cube. Chop the onions, celery, carrots, green chili and apple. Pour 2 tbsp olive oil in a heavy bottomed pan and add the garlic, as you saute, add the ginger, turmeric and the chopped raw vegetables. Once translucent add the dry spices and let if cook on medium heat for a few minutes. Add the chopped sage leaves, roasted squash, vegetable broth and salt and pepper to taste. Cook for about 30 mins until all veggies are soft and tender. Puree with a hand held blender in the pot or in a regular blender until smooth. At this point you can coconut milk to bring some creaminess. Let it heat through. Serve hot topped with walnuts, fried sage leaves and goat cheese. Delighted to take this to Fiesta Friday 95 with co-hosts ,Loretta @ Safari of the Mind and Petra @ Food Eat Love. An unfortunate accident in my vegetable garden, a foot slips, a bone cracks and life lands with a clear realization of a broken leg. Cast, crutches, knee scooter, cancelled vacation plans and an abundance of crankiness and pain….while dealing with everything that comes with it, I am encouraged that it will help my family cook with me ( as I give direction of course :). I have been looking for simple healing recipes that will be satisfying and help me through this phase. 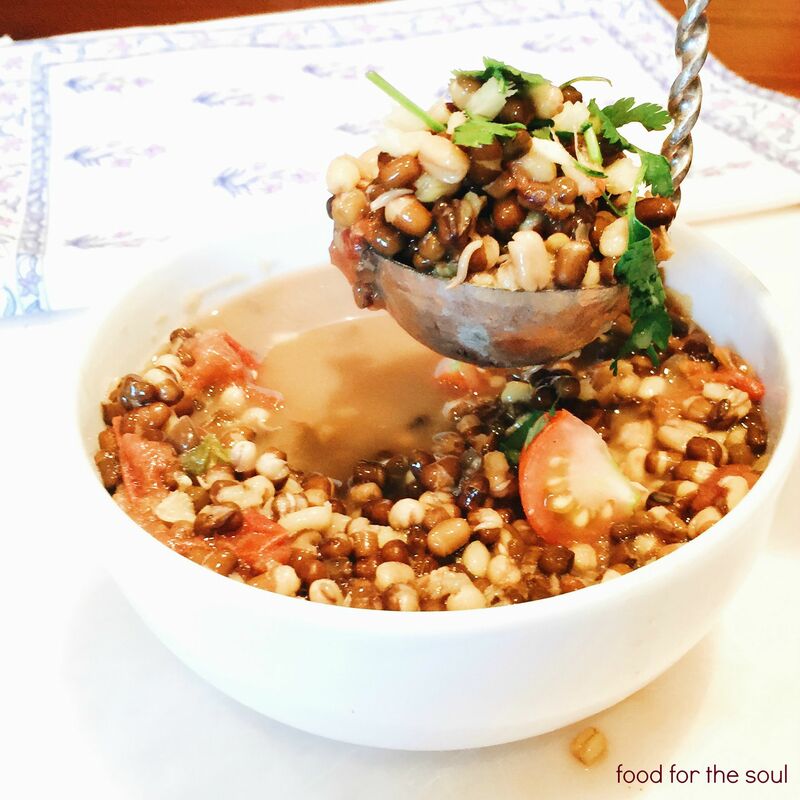 This Sprouted Urad dal soup is simple and nourishing. 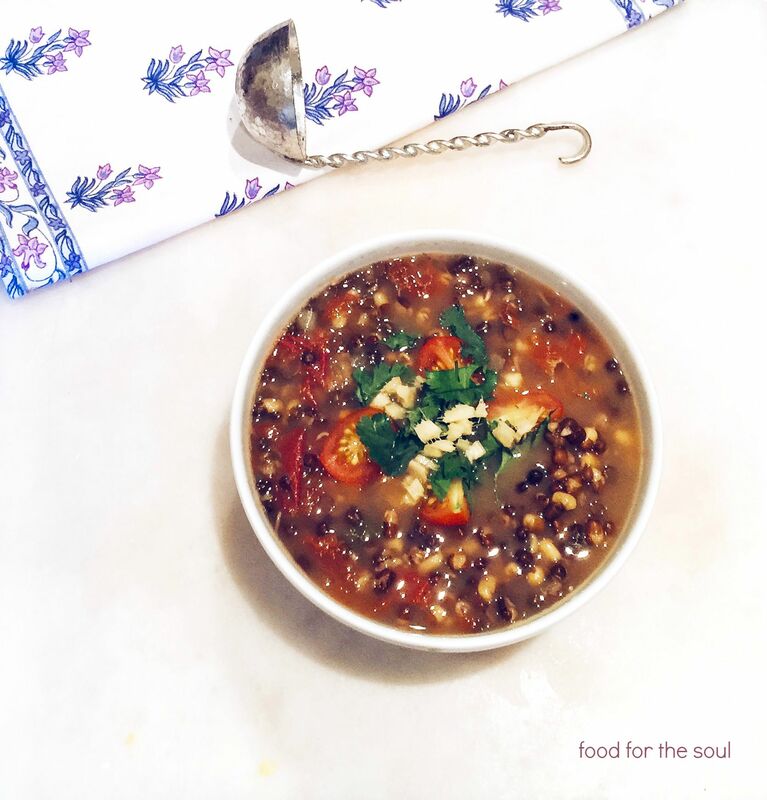 I had started sprouting the Black Urad dal before the fracture intending to use in in salads but it ended up pressure cooked into a delicious soup. Sprouting is a great way to liven up your regular lentils adding that extra crunch and the extra punch of vitamins the germination process brings. Use a sprouting process that works for you but the basic way is to soak in water overnight the first day and then rinse and drain twice a day leaving covered with a damp towel. Sprouts should start to come out in day 3-4. After that point you can store in the fridge for a couple of day while using to add to soups, salads and stir fry…or just snack on them like I do. In and pressure cooker combine the first 8 ingredients and pressure cook for 7-8 mins. Release the pressure and keep on low heat. Adjust the seasoning and add the ghee. Serve topped with chopped tomatoes, cilantro, zest, ginger and a squeeze of lemon juice. 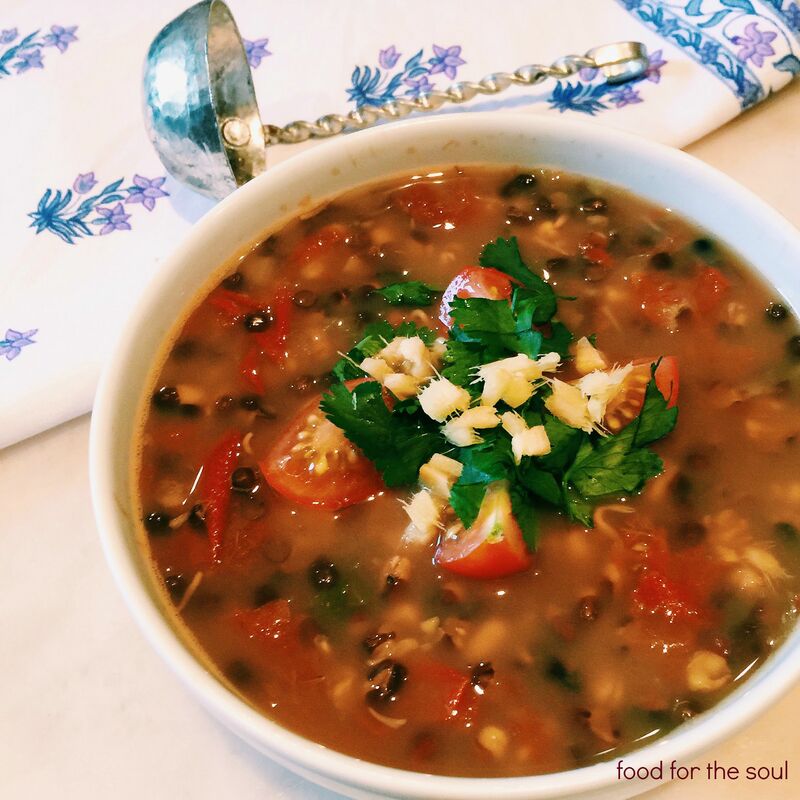 Taking my healing soup to Fiesta Friday where the co-hosts are Judi @ cookingwithauntjuju and Petra @ Food Eat Love. Bulgur is a whole grain, naturally high in fiber, low in calories and has a chewy texture that makes it great for soups. I cook the grains separately as I would cook rice and use in tabbouleh , salads and soups. Please note that my recipe for tabbouleh ( https://foodforthesoul00.wordpress.com/2014/11/29/tabbouleh/)uses a fine grain cracked version. Here I have used the whole grain. Veggies used are: Chopped turnips, carrots, roasted butternut squash ( or raw), onions, celery, garlic. You also need organic vegetable broth, 1 tsp cumin seeds, 1 tbsp ground coriander, 1/ tsp cayenne, salt and pepper to taste. In olive oil, fry chopped onions and garlic until translucent,add cumin seeds and fry for 30 secs or until they pop, add the spices and fry until fragrant. Add all the veggies and the broth and cook for about 20 mins. At this point you can use a hand blender to mash some of the veggies leaving chunks still in there. You can take some soup out if you want, blend and put it back in the pot. Add cooked bulgur and cook for another 10 mins on medium heat. Serve topped with cilantro ( because i love it) with a side of crusty bread . 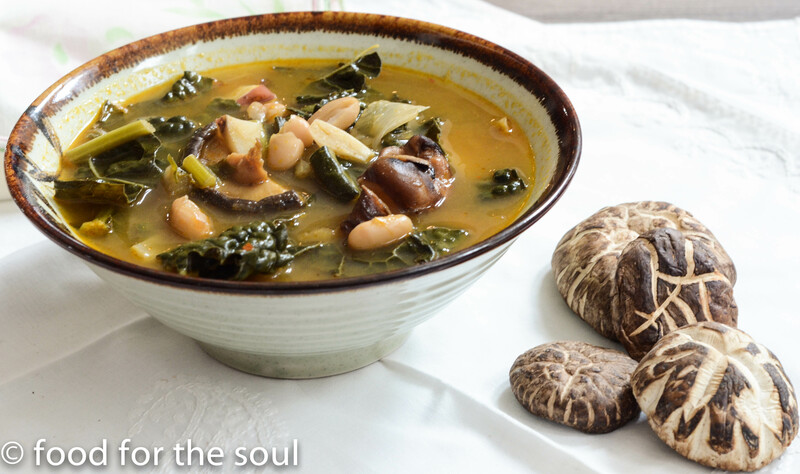 Simple, hearty, healthy and delicious on a cold winter day.